Sure, it looks really ugly, but the sky is not even remotely falling. This team is stacked with talent and we have been improving depth bigtime over the last several drafts. We absolutely have a few huge holes, (Offensive Coordinator, OG, and DT) but we are in an excellent position to fill them with solid to top tiered replacements. We have one of the best QBs in the NFL who should still play at an elite level for minimum 5 more years if we protect him. We really are not far off. We need new coordinators, any good NFL OC would jump at the opportunity to work with our group. A veteran ( not college) OC could turn offense around mmediately .....we are stacked. This is stil, DQs defense, I don’t see the DC job that difficult to correct. Same with any underperforming position coaches. We need a dominant, bad t9 the bone DT and the stars have aligned perfectly for us to get one with our top pick in 2019 draft. There are 4 top tier DTs in this draft, we should have our choice of 2 or 3 of them by our pick. This one pick could transform our DL. You put Grady and another dominant disruptive DT next him and Tak gets 15 sacks next year. We need a couple of OGs. We need to draft 2 this year with high picks and sign a veteran. Not sure what happened to Schraeder but he’s played well for 5 years, maybe he’s go personal issues distracting him or an injury we don’t know about but he should be fine next year unless there is something we don’t know. You don’t play well for 5 years then forget how to play. We will get to pick at top of each round, and we get 4th and 5th round compensatory picks for Poe and Gabriel. We are in an excellent position to make an immediate rebound. Our biggest issue is teams beating up our lines and the entire team collapsing. This is correctable, we have some awesome pieces already but need to get rid of the bad ones and stock up in draft. With one more dominant OL and DT to replace the weakest ones the team changes. But we have resources to get more than 2. I see this as a fluke year where much of what could have gone wrong went wrong, exposing some weaknesses that needed to be fixed before moving up to next level. .As a team, I think we come back next year better than we were in 2016 and jump right back in the Super Bowl Hunt. The sky is not even remotely falling. This team is stacked with talent and we have been improving depth bigtime over the last several drafts. We have one of the best QBs in the NFL who should still play at an elite level for minimum 5 more years if we protect him. We really are not far off. We need new coordinators, any good NFL OC would jump at the opportunity to work with our group. A veteran ( not college) OC could turn offense around mmediately .....we are stacked. We need a dominant DT and the stars have aligned perfectly for us to get one with our top pick in 2019 draft. There are 4 top tier DTs in this draft, we should have our choice of 2 or 3 of them by our pick. We need a couple of OGs. We need to draft 2 this year with high picks. Not sure what happened to Schraeder but he’s played well for 5 years, maybe he’s go personal issues distracting him or an injury we don’t know about but he should be fine next year. I think we come back next yea better than we were in 2016. I like the optimism. I'm not typically a guy to say, 'fire everybody', but I wouldn't have a problem with bringing in a new OC and demoting MM. We need a WC offensive coordinator that knows the pro game and can exploit matchups. I was willing to give Sark at least two years and he's taking too long to adjust to this league, IMO. Dan also needs to just take the reigns and call the defense, he has a truly impeccable feel for the game in that aspect. I believe the team lost confidence after all the slew injuries to Dieon Jones, Neal and Allen who were vocal leaders and signal calers, followed by teams starting to dominate our lines, taking advantage of the weak spots. I also think we need a legitimate NFL OC. I was always worried Sark come MG out of college was a big risk. He is way too inconsistent and I don’t think the offense has confolidenxe in him any longer. The meltdown isn’t all his fault but he’s not part of the solution movin forward. I saw a perfect storm of things take us down but I also believe minor adjustments with two new dominating lineman while getting rid of the weak links will turn this thing right back around to where we are better than 2016. Go away. You know nothing about this game if you don’t believe this could quickly turn around. Absolutely agree.We can get this thing back on track very quickly with 2 guards, a monster DLineman and a new OC (Kubiak). Not trying to rain on anybody's parade, but this team has a ton of issues (players and coaches) to correct and I'm not totally sold that they're going to make all the necessary moves to be a competitive force like they should be. I've seen this offseason show way too many times. This team loves to settle for the ordinary. I tend to agree with you, but objectivity is currently out of season in these parts. Do you think we need to address RB? Maybe a journeyman type FA or a late draft dart? It will be hard to keep Coleman. I like Freeman's game. I'm just to the point where it is hard for me to see him being a 20 touch per game guy over a 16 game season ever again. RBs with a rash of injuries usually don't magically get over them and go on to a healthy career. He is only 26 I think...so I guess a full recovery is not totally impossible. Meanwhile, keep giving Smith carries and see if he grows with experience? Maybe Smith gets it done behind an actual NFL line? Its not a priority, but it will demand some of the team's attention this off season in my opinion. I mentioned in one other post that young guys getting snaps is the silver lining in the storm that is 2018. We know what Riley looks like playing with and against NFL players. We know the same about Kazee. We have seen Smith as the workhorse. 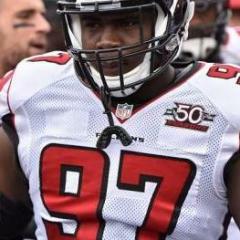 We know that Ridley won't be the savior if we let Julio go over contract issues. I contend that it is next to impossible truly evaluation young players in the preseason. The level of talent on the field and the level of competition are just not comparable to regular season action. So, Quinn and company got a chance to throws some guys in the fire and learn what they have to offer. That doesn't help us this year, but its like an investment drawing compound interest. The knowledge pays off big as you start to make roster decisions now and in the future. 1. "We need new coordinators..." I guess this means offense, defense and special teams. It is true we need this, but each of these coaches will need to teach their philosophies and possibly draft new personnel to fit them. Even Shanahan struggled in his first year. 2. "We need a dominant DT and the stars have aligned perfectly for us to get one with our top pick in 2019 draft." I agree with you here. Will we get a dominant defensive player or will we draft another Beasley? 3. "We need a couple of OGs. We need to draft 2 this year with high picks." So, I guess we go DT, then OG and OG? Got it. The last time we picked OL in rounds 2 and 3, we got Peter Konz and Lamar Holmes. 4. "Not sure what happened to Schraeder... but he should be fine next year." So, our RT, who was benched for Sambrailo last week is going to be elite next year? 5. "Our biggest issue is teams beating up our lines and the entire team collapsing. This is correctable, we have some awesome pieces already but need to get rid of the bad ones and stock up in draft." Like we have done...when? 6. You didn't say this, but I will - we are all assuming that our injured safeties and RB come back next year and play at Pro Bowl level. How did that work out for Trufant? 7. Finally, you said: "I think we come back next yea better than we were in 2016." By that, I guess you mean we win the Super Bowl. And, you tell me I know nothing if I don't believe all these things happen. Would you have picked Kansas City or Chicago as very likely Superbowl contenders to start this season? In both cases, these teams appeared to have major problems but just a young QB taking over for one and a veteran LB taking over for the other have completely transformed these teams. The Falcons do have problems but in a lot of cases they are interrelated. The 2016 Falcons were great when they had a steady, solid OL and the lack of it this year has totally disrupted it since midseason of this year (our offense was strong the first half of 2018). As for the defense, injuries have been a part but also decline in CB and DE play. If we draft a solid rookie at one of these positions (or both?) and find a FA for the other, we could be a couple of players away. As for coaching, a simple upgrade to one or both of our coordinators is not that ridiculous (we already have changed both of them once under Quinn). A football team is like a car - the car may be running fine but then has a hose or something bust (the OL?). The car may not run temporarily and needs to be fixed, but it is unwise to just go out and buy a new car. And, if you simply fix the broken hose, the car is running fine again with a $50 repair. What you are saying is logical. What the OP was saying was not. He didn't say there was a process for getting things back on track. He said with a few tweaks we would be better than we were in 2016. I am rooting for this team to turn it around as much as anyone else, but let's just be realistic. Both KC and Chicago have 2nd year QBs (on rookie salaries) taking a big step up. KC was 10-6 last year and won their division. Chicago added some random player named Khalil Mack. I want a fresh young college OC. But those guys get scooped up to be head coaches the second they show success. Yep, little things can derail a team and make it look far worse than it is.....you are nailing it. Most of that offense was there in 2016 when we were 7th in NFL history in scoring. The notion the sky has fallen, we need to rebuild or thatwe are years from a turnaround is unhinged panic. The defense is DQs, it’s not a panic and rebuild situation at all. It’s a get healthy and add a couple of pieces situation. Some people are just freaking out, others are just trolling. The changes tha need to be made can be made in the off-season and the team can be right back in Super Bowl fight next year. Our next OC is the key. You don’t play well for 5 years then forget how to play. OC change to Gary Kubiak. DT with the first round pick, Ed Oliver or Quinnen Williams. OL with our 2nd and 3rd round picks. I could get on board with Kubiak and Oliver/Williams. Dimitroff has given me zero confidence in our ability to draft offensive lineman. I would rather target ones in free agency, and pay up. Or trade picks for established solid offensive lineman if possible. Also, I think we should let go of Beasley and get a pass rusher opposite Takk that can do greater damage on a more reasonable deal, such as an aged vet, someone proven and consistent. If we revamped our Defensive line, offensive line and got healthy, there is no reason this team can't contend. We'll at least be a playoff caliber team next year. I do still think we have a lot of talent on this roster, but it obviously takes a lot more than talent to be successful in the NFL. For whatever reason we've been complacent this year from the FO and coaches all the way down to the overall mindset of the team. If there is one thing you can't do in the NFL, it's resting on your laurels and we've been guilty of that this year. Positions we considered strengths going into the year, like cornerback, right tackle, even RB to an extent, haven't been. Players like Grady and Takk that were expected to kick on, haven't done. Takk in particular frustrated me, seeing a guy coming off a promising rookie year spending most of the offseason eating fast food, doesn't scream greatness to me. That said I really don't think it will take much to turn this team around. I do expect we'll make some coaching changes. One good offseason and a general change in mindset can turn this team back into a contender.